Today’s local governments are placing inclusion at the top of their agendas and private anchor institutions—and their developers—need to as well. For most developers and policymakers who’ve honed their craft for a couple decades or more, inequality is an externality—a challenge created by development. Cities were—and to a large extent, still are—no different. They embark on new construction projects, make necessary improvements to their aging infrastructure and attract rising shares of business and talent, all the while growing accustomed to profound levels of poverty, segregation, and displacement. But the tide is now changing. While today’s local governments are placing inclusion at the top of their agendas, private anchor institutions are also focused on community engagement in the form of new public parks, highway underpasses, and affordable housing initiatives. I hope these three examples of an inclusive prosperity strategy inspire your future projects. One year ago this month, the NYUSPS Urban Lab at the Schack Institute of Real Estate outlined the need for urban anchor institutions to adopt an inclusive prosperity strategy. Our paper, “The Case for Inclusive Prosperity,” called upon universities, medical centers, real estate developers, and high-tech companies, among other anchors, to combine their considerable resources to build more diverse, equitable communities. In defining inclusive prosperity, we identified four key pillars that achieve both equity and economic progress. The one I’d like to share with you is about improving processes to design and build more inclusive public spaces. I hope these three examples of an inclusive prosperity strategy inspire your future projects. While most public spaces are designed with their community in mind, not all have been successful at catering to residents who need them the most. Thankfully, many developers, design firms, and city governments have come to learn from projects like The High Line in New York City, whose initial design became a magnet for exclusive, high-end development. Today, a growing number of public spaces are built specifically for low-income or disadvantaged residents, or as celebrations of a neighborhood’s history and diversity. While high-profile companies and retailers are often attracted to new public assets, designing for inclusivity allows all members of a community to benefit from these developments. For its more than 30-year history, The Design Trust for Public Space has paved the way for inclusive landscape and architecture. In 2002, the non-profit organization’s study helped prevent the demolition of The High Line, one of the most iconic public spaces in New York City. The study also included a number of recommendations for reimagining the historic structure, many of which have since been implemented. More recently, Design Trust partnered with the New York City Department of Transportation to reclaim the unused land beneath the Gowanus Expressway in Brooklyn. Their collaboration represents the first major effort to document and analyze New York City’s el-space, or space beneath an elevated transportation structure, including highways, rail lines and bridges. Their vision became a reality in May, when they launched a pilot program to coincide with NYCxDESIGN 2018, an annual design celebration. The project features an alternative walkway, improved lighting and parking space, and new systems for green infrastructure, including low light plants, which capture stormwater and improve air quality. According to Design Trust’s executive director, Susan Chin, the initiative presages a series of five more pop-up el-spaces in New York City, which is currently home to around 700 miles of elevated infrastructure. 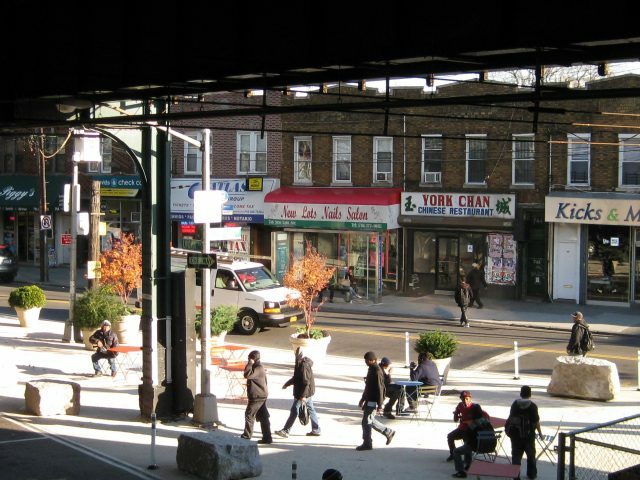 As these projects continue to expand, they are quite literally removing barriers between New York neighborhoods, helping to integrate communities through the creation of shared public space. And yet, like any major construction or redesign project, el-spaces run the risk of alienating local residents. Because of this, developers must be deliberate about the kinds of tenants they select. Instead of allowing major companies and high-end retailers to gravitate toward spaces with the greatest land value, developers must prioritize areas with disadvantaged residents, who stand to gain the most from the revitalization of their neighborhoods. In the late 19th century, the Domino Sugar Refinery was the largest sugar refinery in the world, producing more than half the sugar in the U.S. After decades of turmoil, including a fire, an explosion, and one of the longest labor strikes in New York City history, the plant eventually closed in 2004. Today, a massive redevelopment project is breathing new life into the 11-acre site, thanks to an innovative collaboration between the architecture firm James Corner Field Operations and the development firm Two Trees Management. The project, which will cost an estimated $3 billion, consists of a public waterfront park featuring restaurants, green space, and an elevated walkway. Like its namesake, Domino Park is an homage to the site’s rich history. The new design features four 36-foot cylindrical tanks, which were used to collect syrup in the refinery. The site also features signs, screw conveyors, and bucket elevators from the original structure, as well as new amenities like a sand volleyball court, skate park, dog run, bocce courts, and a children’s play area designed to resemble the old sugar refinery. The most successful efforts to spur local innovation, entrepreneurship, and creativity hinge on collaboration. Tapping into visionary, energized movements in the form of public-private partnerships or grant programs means a lot of the heavy lifting is already done. And sometimes, collaboration can happen with just one person. In the case of the Sara J. González Memorial Park in Atlanta, the process began with Isabel González Whitaker, a former magazine editor who petitioned to have a local park named after her mother. In 2014 a local developer took notice of her impassioned, driven campaign and made a sizable donation to the project—and her vision. With new funding under her belt, González Whitaker established four pillars of diversity and inclusivity: making the park fully compliant with the Americans with Disabilities Act (ADA), installing accessible playground equipment such as “Zero G” swings and wheelchair ramps, mandating a new soccer field, and developing a legacy plaza that honors Atlanta’s diverse population. As cities and anchor institutions begin to understand the value of diversity and access for all residents, they must develop a clear strategy for their investments. For inclusive prosperity to be successful, it must combine the knowledge and resources of local government, anchor institutions, and community members. Together, these institutions must adopt a place-based strategy that caters to the individual strengths and needs of a community. Resonance has extensive experience in the development of complex mixed-use developments in both urban and resort environments. We’d love to speak with you to help distill and articulate a vision for your project that resonates with all your desired audiences.